This week’s champion guest, Frank Aragona is a perennial top 10 Competition Eliminator National points finisher. He has stood at the top twice now, once in 2007 and of course this season. 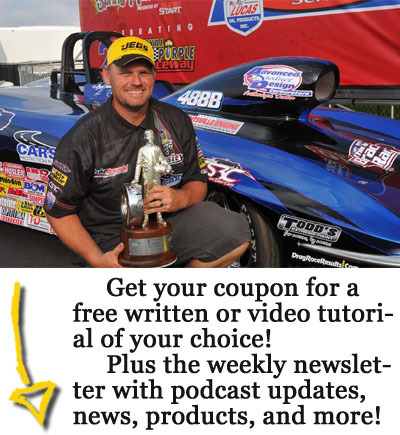 Nearly a dozen national event wins to his credit, Frank has seen a lot of success in Competition Eliminator, but has also dabbled in nearly all of the NHRA sportsman categories with success. Frank is a huge proponent for Competition Eliminator and you can hear the true passion in his words about the class!